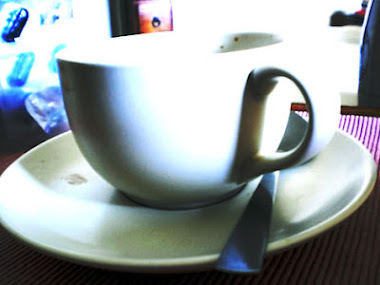 At the outset, tea was the focus; my window to the world. 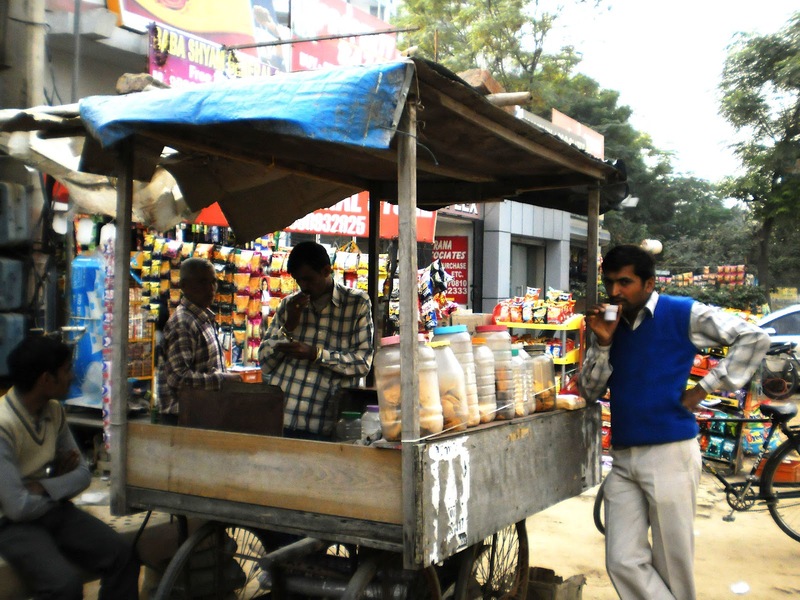 I was looking at people on the streets who made and sold tea; at truck drivers sipping tea at the chaiwallah[i] stalls or dhabas[ii] as I passed by the Hindustan Petroleum depot at Bijwasan en route to Delhi, and more. 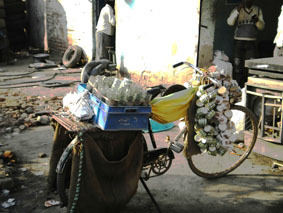 This street life interested me but gradually I saw that drinking and making tea was integral to everyone’s daily life. 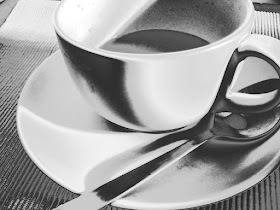 Whether it was going to an exhibition opening or interviewing an artist, dropping by to see a friend, reading a book or reflecting over the previous day’s events over a morning cuppa, everything seemed to be linked to tea, including the dramas with my domestic help. However, the flavour that one found in the street settings was in many ways a contrast to this. And these people with their different life-styles and culture added that extra dash of colour to the canvas of my ‘garam masala chai’. 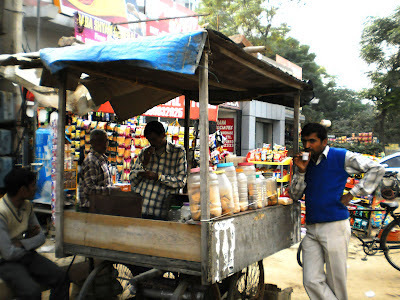 When I started consciously looking around me, my first encounter was with Govind from Bihar who had a moveable cart as a tea-stall, just outside Celebrity Suites in Palam Vihar. I had barely left home when Bhupinder, who was driving my car, pointed him out to me. I was surprised not to have noticed this stall in all the years I have taken this route to Delhi, so ventured enthusiastically to take photographs but Govind was hostile. I was not about to be derailed on my first stop so explained what I was doing. He was neither impressed nor interested and barely seemed to listen. It was not a great start for me but I persisted and it took a good half hour or so before he eased up. He made some tea; I’d just had some before leaving home, so Bhupinder had a cup. Govind kept his utensils clean and neatly arranged. He served biscuits and gutka[iii], supari[iv] and crisps along with tea. People came and went, but not many. He was rather self-conscious and did not respond affably to questions about his life. Physically, he made quite a picture: well built with a growing pot-belly, bulging out from beneath his pale blue T-shirt, under a khakhi-coloured jacket whose buttons were left open and, his odd, sort of pointy, knitted cap. He was not to be seen in that space for a long time, after that. The cart lay abandoned for months and then, one day, he was serving tea again. I went up to say hello and asked where he had been and was told that he’d gone home to tend the fasal[v]. Sometime later, I found someone else at the stall. His younger brother had come to take care of this business while Govind handled farming duties back home. 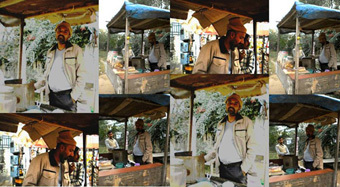 On my exploration, I was to discover that numerous tea stalls, in and around Delhi, were run by people who had migrated from other parts of the country. I was also intrigued by the idea that tea, which was not really a native drink, but ‘imported’ into the country by the British, had somehow become the mainstay of the man on the street, both as a beverage and a business. Historically, this expansion of tea consumption, brought about through the development of ‘chai’, occurred only after 1947. The evolution of this kind of tea, made by boiling tea leaves in a mixture of milk, water and sugar, with optional spices such as cardamom, cinnamon, clove, ginger and black pepper, came about with changes in the technology of tea processing. The full-leaf black teas were replaced by CTC ("crushed, torn, and curled") leaf which not only enabled tea estates to double their production but consumers could brew stronger infusions from smaller quantities of the more potent, tightly-rolled leaf granules. This lowered the cost of producing tea, making it accessible to the common man on the street, such that sixty-five years later, it has acquired a strong ‘Indian’ identity. Coming from Gurgaon on the outer Ring Road, just near Vasant Vihar, an old woman sits near tyres and tubes catering to a steady custom from the neighbouring petrol pump. White haired and petite, she squats comfortably on the pavement, making tea and omelettes. I love these omelettes rustled up on the street, with plenty of green chillies and stuffed between two slices of white bread. 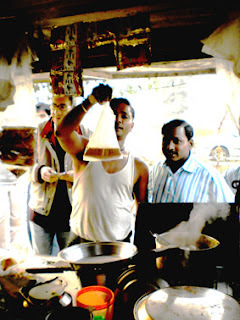 She also serves mathris[vi] favoured by workers from the petrol pump. There was a tremendous amount of curiosity from helpers at the gas station and passersby as I took photos of this diminutive, forlorn looking woman busy at work. But she was too busy serving her customers to even notice or care who came and did what, as long as you drank and ate something from her stall. It was winter and she was clad in a pink saree with a russet, almost dirty brown coloured shawl, carelessly wrapped around her shoulders with cheap nylon socks covering feet that were awkwardly shod in black plastic chappals[vii]. Sitting against a discoloured, greyish wall, surrounded by bright white eggs, dull aluminium pots, black tyres and tubes, she made an interesting study. Every time since whenever I passed by, I saw her dressed in the same printed, pink polyester saree I’d photographed her in, when I first stopped by for tea and an omelette. Then, I noticed she was missing from her spot by the petrol pump. I thought that the MCD[viii] must be doing some sort of clean-up and she had been asked to move. Some months went by, I kept looking out for her and then one day her pink saree caught my eye. I was curious as to why she had been missing for so many months so stopped by to talk to her. It turned out that her son had cirrhosis of the liver. He’d been admitted into hospital, so she’d shut shop to take care of him. She complained that he drank too much and as a ‘baccho ka baap[ix]’ his behaviour was irresponsible. Ramvati and her husband Hangal had come to Delhi from Burari in Uttar Pradesh, as she recounted: “When India fought the 1965 war with Pakistan and Lal Bahadur Shastri was the Prime Minister of India.” Ramvati was, by her estimate, over sixty years old, had been married at the age of fourteen. 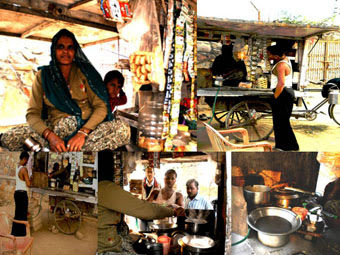 She and her husband lived in a jhuggi[x] near a private school in Vasant Vihar. 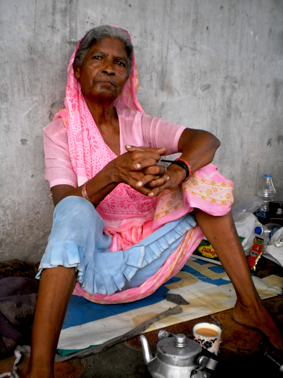 I came across another migrant tea-stall lady in Palam Vihar, right at the Delhi-Gurgaon border post. The ample bodied Naina Devi was dressed in a printed salwar kameez[xi], wearing a pale olive-ish green sweater embroidered with red and white flowers over this, and a peacock-ish blue dupatta covering her head. She sat crossed-legged on her cart, inside it, making tea. Her young daughter Poonam played nearby while Naina served a steady stream of customers. Residents of posh Palam Vihar, labour working on construction sites, local policemen, drivers from neighbouring houses to passersby who came on foot or riding motor-cycles, all patronized her stall. Naina Devi hails from Ajmer, Rajasthan. Naina was the only one left here with her stall because at the time of the CWG[xii] clean-up, the authorities had moved everyone else away. She now had her cart positioned at the periphery of some private farm land and paid to park it there. Her husband worked in Delhi for a ‘company’ while she sold tea. Naina was friendly and asked why I wanted to take photos of her and her cart. She posed obligingly and so did her customers. Her clientele was mostly labourers who took the tea in plastic bags because it dispensed with the tedium of buying, carrying and storing an aluminium kettle. To others, she served tea in plastic cups. Unlike most chaiwallahs she did not make tea in the ubiquitous aluminium kettle. She used a cup-like ladle to pour milk into a dekchi[xiii] where she ‘cooked’ the tea. This was also used to pour tea into cups. 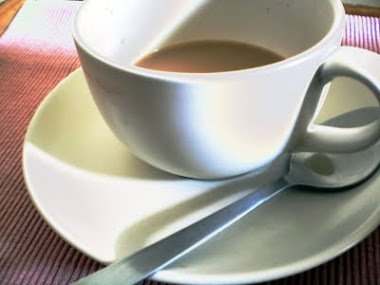 For those who took tea in the plastic bags, a small, ridged, thickened, greenish glass, often seen in a chai ki dukan[xiv], was used as a measure. A pile of debris lay beside her cart. I assumed it was either left there or swept into a corner at the end of the day and wondered why a dustbin could not be used instead. Some labourers drank the tea sitting on their haunches on the pavement, crouching on a large stone or on the ground itself, comfortable almost anywhere it seemed. But when it came to disposing of the cup, they just chucked the plastic cup in the air, letting it land wherever it did, uncaring of cleanliness. Most of these people seemed to come from rural areas and small towns. They come as labour to build other people’s homes or as businessmen, selling tea in between harvesting the crop in their village lands. Did this create lack of a sense of belonging? Was it their reason for not keeping the place clean? 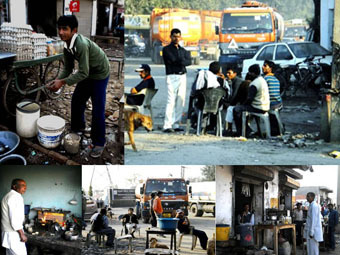 I also noticed that the dhabas patronized by truckers in Bijwasan just threw their garbage onto the street. The trucker drivers didn’t seem to notice or care. They kept their vehicles in tip-top condition but did not care the same way for the streets they roamed. Mongrel dogs sat at their feet and fed off the garbage whilst they sipped tea and chatted. This apathy reminded me of countless occasions when I’ve seen even relatively affluent households sweep garbage away from their doorstep onto the street, as if the responsibility for cleanliness and hygiene ended there. It has always irked me to see people deface the walls, throw refuse onto the streets from moving cars, spit and urinate on the road. They do not think the streets belong to them, which really baffles me because, if they do not belong to citizens of the country, then to whom do they belong? Realistically speaking, neither tea nor any beverage for that matter, can possibly take on such an onerous task; however we can, but do we? The larger question that troubles me is why is it always someone else’s problem, fault or garbage? When will we start taking responsibility for little things in our daily lives and feel a sense of belonging? Delhi is made up of a large migrant population. My own father’s family came here after partition and there are many of us who have thus become Delhi-ites or residents of Gurgaon. 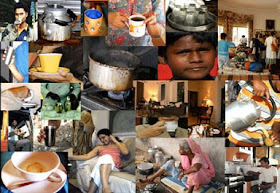 These migrant tea-wallahs made me question the idea of belonging: what does it take to claim ownership in little the things that make up a nation?